Shopify, an e-commerce platform, is on their fourth office in their sixth year of existence, so they’ve learned a thing or two about offices. One important thing they’ve learned is that they don’t like open floor plans. 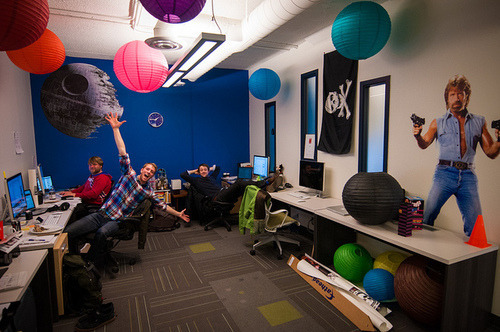 At Shopify, they work in pods, which are rooms of the 6-8 people you work closely with on a day-to-day basis. The pods shoot off from a central hallway loop. On the outside of the loop are the pods, and on the inside are small private meeting rooms and conference rooms. Attached to the core of the office is a big open space called the Annex where they hold their weekly all-hands meeting and host events in the community. Daily free lunch and a big, central kitchen with free drinks and snacks facilitate collaboration and serendipity, but when people open themselves up to it, not on a constant barrage. The configuration shows the value the company puts in quiet, distraction-free coding with your core collaborators. Open floor plan offices are noisy and distracting and that can prevent engineers from getting in a state of flow. There was definitely plenty of fun to be had in the office, but those areas weren’t in places that would create distractions for others trying to work. To me, this reflected an organizational value of work-life segmentation. We worked out of Shopify’s office for a week, and we were shocked to see engineers come in at 9 and leave by 5 on a daily basis. 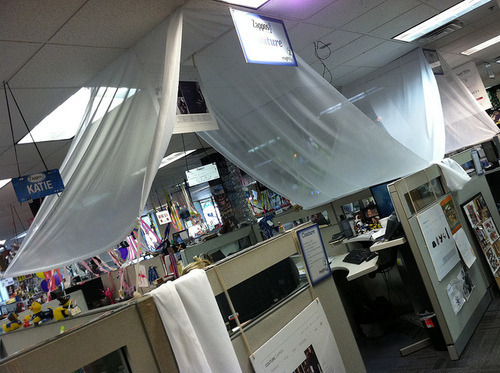 Similarly, concentrated work happens in the work areas and hanging out and relaxing happens in the lounge areas. In Silicon Valley, work and play is all mixed up together so it sometimes feels like you’re expected to work and play all at the same time all the time. They have a open floor plan at Zappos with team-oriented bullpens, but for them, that’s far from sufficient in ensuring serendipitous interactions and a culture where everyone knows everyone. Zappos CEO Tony Hsieh is famous for taking measures to hack serendipity like only allowing Zappos employees to enter through one door in the building to force spontaneous encounters. Zappos is taking the concept of the “open floor plan” to the next level with what you might call an open floor plan community. The irony of the open floor plan Silicon Valley corporate campus is that they’re typically cloistered away from the community at large in their own ivory tower. Openness, collaboration, and nonhierarchical organization is the order of the day, but among themselves only. 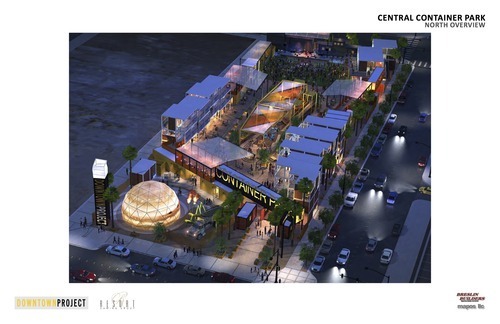 Zappos’s $350 million project to bring its HQ from suburbia into downtown and revitalize downtown Las Vegas reimagines what an open floor plan office can be by opening itself up the entire community. It’s inspired by the idea that companies become more productive when they collide with people and ideas in the broader community, and the entire plan is organized to facilitate interactions not just between employees, but within the community, from the placement of the buildings and public spaces, to the grassroots investment model and the community-oriented projects being funded. In some ways, the Downtown Project is an experiment in taking the open floor plan office to its logical extreme. It blurs the distinction between companies in the same way that co-working does (no wonder co-working is a big part of the Downtown Project) by subsuming individuals into a broader community. What’s your take on open floor plan offices? How does your company balance work and play and openness and distinction? We’d love to hear your thoughts in the comments. Open plan offices are wildly over-rated. 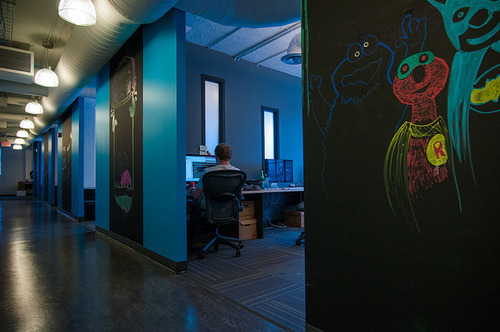 Open offices completely ignore a large segment of people who work for companies – introverts. Many people need to concentrate, I’d assume people writing code would be one group that would need quiet space, yet works spaces are either cubicle farms or just completely open. This only serves extroverts and loud, social people. In the work I’ve done – editorial, working with numbers, I needed to concentrate. My productivity suffered greatly as a result. I do not want to hear someone shouting over my head or random conversations about what was on tv last night. We don’t need to be “collaborating” and talking 8 hours a day. For those of us who don’t work in sales or customer service, we need time every single day to concentrate. Very few people have private offices with a door anymore, this seems only reserved for executives. It amazes me how companies are in denial about lost productivity. This is good for e-commerce?